Guitarist/composer Michael Pisaro is a well-known figure associated with the Wandelweiser group, a fluid collective of composers and musicians interested as much in the spaces in between sounds as in the sounds alone. 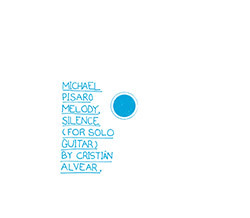 This interest is conveyed not only in the title of this single long work for solo guitar, played by Chilean guitarist Cristián Alvear, but in the structure of the work itself. Melody—or more frequently, harmony—and silence are the two fundamental states between which the forty-six minute long piece oscillates. The piece is largely a sequence of discrete chords or notes played individually or clustered together in packets of a few, separated by silences. Each chord or tone is allowed to linger and decay at its own rate. Some chords work together like progressions with more or less expected cadences, while others eschew any allusion to resolving, sounding instead like juxtaposed aggregates of tones, some of them combined into dissonances of varying degrees of pungency. At about four minutes in, an unexpected, recurring third element is introduced—a prolonged sine tone (or ebow?) that in its initial occurrence here lasts for nine minutes or so. Because Melody, Silence is made up of a set of components to be arranged by the performer, the piece as played on this recording is a reflection not only of Alvear’s fine touch, but of his structural choices as well. the Bohman Family 13th Anniversary Spectacular! The Robert D. Bielecki Foundation has given a $15,000 grant to the Vision Festival. Jaga Jazzist is profiled regarding their new album. 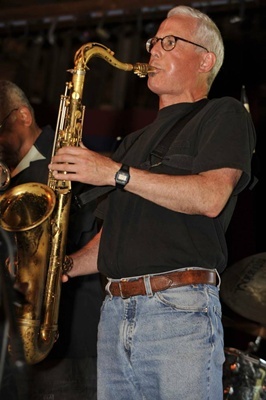 The now-defunct Chicago Reed Quartet is briefly profiled. Featuring the world premiere of Stumble Smooth, by Gyan Riley. Selections from Secret Chiefs 3 songbook by this French/Belgian acoustic guitar autodidact. Polyhedral relations in rhythm and tonality. Three duos around a keyboard in interactive tessellations pieces “Perichoresis”, “Phyllotaxis” and others. Arrangements of SC3 music for jazz trio. WORLD PREMIERE! A whole new set of Zorn compositions! Presenting new chamber music live ensemble format (Salon/Fantasia) familiar from recorded pieces like “Scorched Earth Saturnalia”. Probably the finest ensemble ever assembled for SC3 in a concert almost entirely made up of of world premiers. Re-invigoration of SC3 staple ensemble, diving more profoundly into the cosmological overlaps with Kang and Kenney. Debuting Spruance and Kang compositions, and performing “Her Sword II” by Jessika Kenney. The Black Hole that SC3 came out of. Proto power electronics and irreducible mega glitch; first gig in 20 years! This concert will begin with a brief discussion between Craig Taborn and John Zorn—followed by a solo piano set and a Trio set. Post-environmental-catastrophe haunting of the wooden machines at the Theatron Animatronique. New compositions added to repertoire! Familiar miniature touring ensemble is here expanded well beyond previous limitations, so listeners might better appreciate these angelic/spectral laments, explosive fireworks displays and automatic pipe organ dirges set in motion by the golems and totems from the mechanical age. Second ever concert of these new Zorn compositions, last chance to hear it before we record it! A collection of music written and recorded for film over a two year period. Debut performance. An exploration of the duets that comprise the quartet through a series of improvisations. Improvisations in the realm of calm suspense. Additional guests may appear. In the tradition of the exquisite corpse one group picks up where the other leaves off in a half-blind improvisational jamboree. Cleric performs their 2010 release, Regressions. Special guests. Cleric and Krallice obliterate the metal genre. Expect comedy. Cleric performs pieces from the Masada songbook. Special guests!